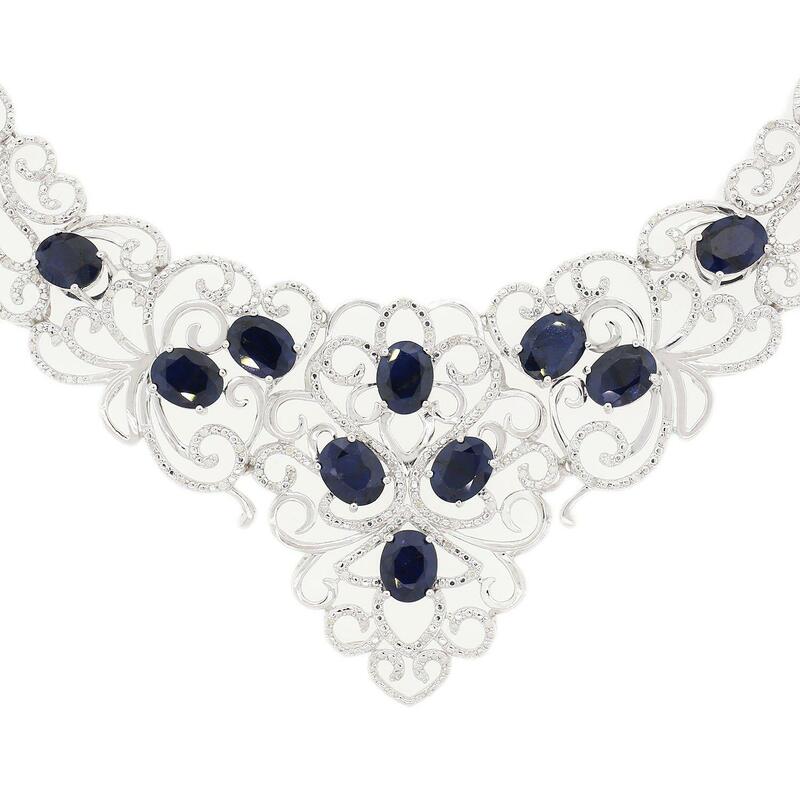 One electronically tested 925 silver ladies cast & assembled sapphire and diamond necklace. The seventeen inch length necklace features sapphires set within filigree diamond ribbons supported by stylized sapphire and diamond links, terminating in a diamond accented box clasp with twin safeties. Bright polish finish with rope detailing. Trademark is A. I. Identified with markings of "925". Condition is new, good workmanship. Thirty prong set oval mixed cut natural blue sapphires approximate total weight of 45.22ct., clarity is heavily included, type II, dark, moderately strong, blue color, (GIA B 7/4), cut is good. Transmitting light somewhat diffusely, translucent. Naturally occurring internal & external characteristics are present. Color grade is an average for the group. Indications of laboratory high temperature diffusion treatment. Graded in the setting. Three Hundred Thirty-Four prong set round brilliant cut diamonds approximate total weight of 334 Stones = 2.24ct. Graded in the setting. Total Weight of Colored Stones 45.22 ct.
Total Weight of Diamonds 2.24 ct.